stumbled upon your site. What a great job ! The pix are good too I know its no easy task cutting out a body shape and making it look professional but you've done a cracking job. One purely cosmetic criticism , could you not have recessed the back plates.It was something that stood out ,literally, in one photo. Thanks for the comment. All criticism is gladly received. Actually, recessing the backplates was something I thought about a bit too late. 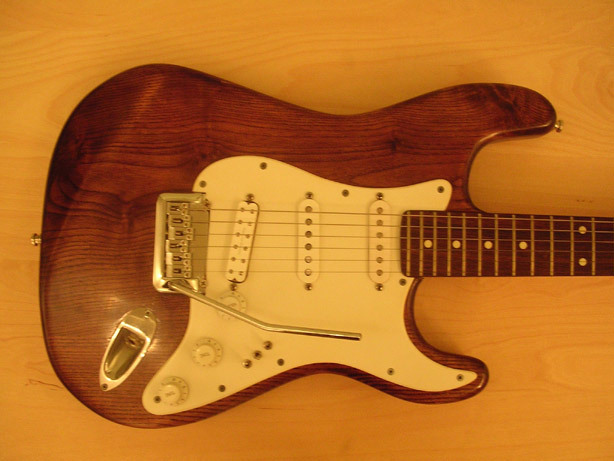 Since it was a Strat, it was something I just didn't consider at the time, since Strats don't normally have recessed backplates (obviously guitars like Les Pauls, etc., do). 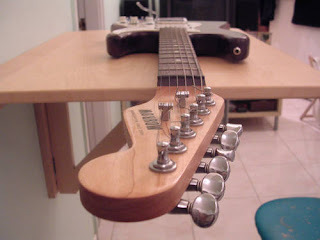 In fact, the whole tremolo thing was an afterthought. At first I just had a hardtail bridge installed, but later changed that. 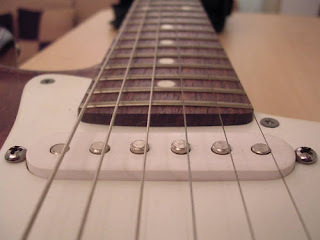 I found that the tremolo affected the sound quite dramatically, and not having it meant I was losing out on some of the famous Strat tone (at least that's the way I feel - others may disagree). But yeah, a bit of better planning and I probably would have recessed those things. Once the lacquering was done, doing the recessing would mean risking the finish, and that was something I wasn't willing to do. Well, let's see. There were just two electrical tools: a jig saw and a drill. Apart from that, a round rasp, chisel, rubber mallot, file, sandpaper, little hacksaw. That's really about it. I also used a stand for the drill (just for the neck attachment routing) and some clamps were necessary for various steps. Super job!! Love the lacquer finish, it would be nice if more factory finishes were lacquer, they are much easier to repair when scratched. I know what you mean about the "baseball bat" ash wood you used. It is VERY heavy, but I wonder just how much tone difference it will make if you router out more of the body? 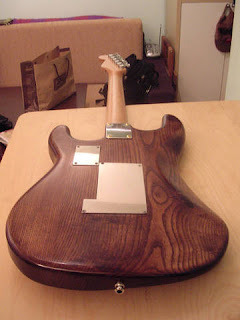 If you like the tone now I would be hesitant about changing it to save the weight. But then that's just me. 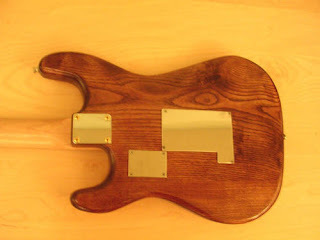 I do a little wood work from time to time, and I own a LOT of power tools to do it with. But I remember building my very first black powder muzzleloader with just wood chisels, a hand drill, and sand paper mostly. It seems like it took me forever, but there was no internet back then and not much in the way of TV to distract me either. (Laugh) It turned out great! Even my friend that owned the gun shop I bought some parts from said it seemed better than the factory ones available at the time. Thanks so very much for your articals. I find them much more complete and informative than anything else I have found on line by far!